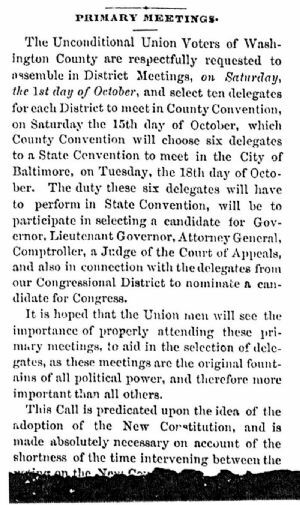 The Unconditional Union Voters of Washington County are respectfully requested to assemble in District Meetings, on Saturday, the 1st day of October, and select ten delegates for each District to meet in County Convention, on Saturday the 15th day of October, which County Convention will choose six delegates to a State Convention to meet in the City of Baltimore, on Tuesday, the 18th day of October. The duty these six delegates will have to perform in State Convention, will be to participate in selecting a candidate for Governor, Lieutenant Governor, Attorney General, Comptroller, a Judge of the Court of Appeals, and also in connection with the delegates from our Congressional District to nominate a candidate for Congress. It is hoped that the Union men will see the importance of properly attending these primary meetings, to aid in the selection of delegates, as these meetings are the original fountains of all political power, and therefore more important than all others. This Call is predicated upon the idea of the adoption of the New Constitution, and is made absolutely necessary on account of the shortness of the time intervening between the writing on the New Constitution.